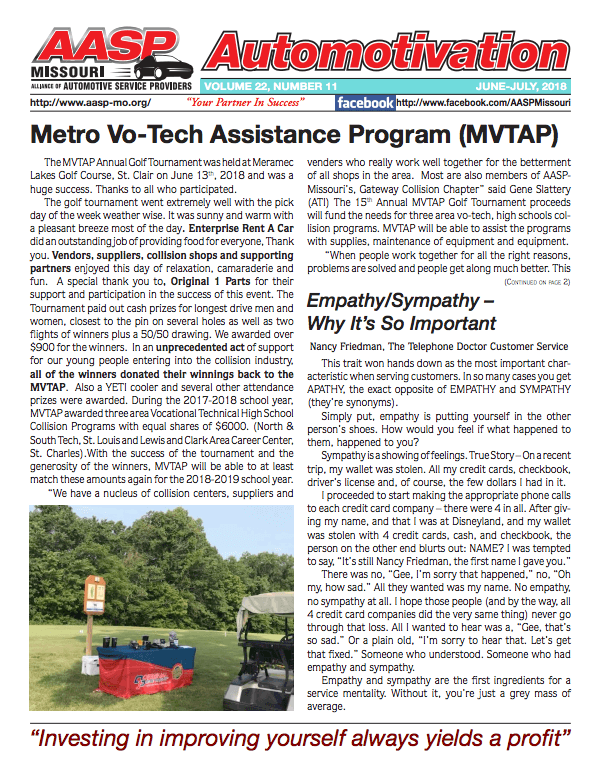 The MVTAP Annual Golf Tournament was held at Meramec Lakes Golf Course, St. Clair on June 13th, 2018 and was a huge success. Thanks to all who participated. The golf tournament went extremely well with the pick day of the week weather wise. It was sunny and warm with a pleasant breeze most of the day. Enterprise Rent A Car did an outstanding job of providing food for everyone, Thank you. Vendors, suppliers, collision shops and supporting partners enjoyed this day of relaxation, camaraderie and fun. A special thank you to, Original 1 Parts for their support and participation in the success of this event. The Tournament paid out cash prizes for longest drive men and women, closest to the pin on several holes as well as two flights of winners plus a 50/50 drawing. We awarded over $900 for the winners. In an unprecedented act of support for our young people entering into the collision industry, all of the winners donated their winnings back to the MVTAP. Also a YETI cooler and several other attendance prizes were awarded. During the 2017-2018 school year, MVTAP awarded three area Vocational Technical High School Collision Programs with equal shares of $6000. (North & South Tech, St. Louis and Lewis and Clark Area Career Center, St. Charles).With the success of the tournament and the generosity of the winners, MVTAP will be able to at least match these amounts again for the 2018-2019 school year.